The history of paper pallets began with an interest in eliminating the need to return pallets, as well as reduction of pallet weight and pallet cost. Paper pallets emerged as a product of interest in the 1940s due to challenges associated with wood and metal pallets. The benefits that pallet designers saw in paper pallets still hold true for buyers today, including attributes such as light weight, adaptability, cube efficiency and the elimination of empty pallet return. These same benefits were noted by IKEA as being important when it chose to convert to paper pallets. 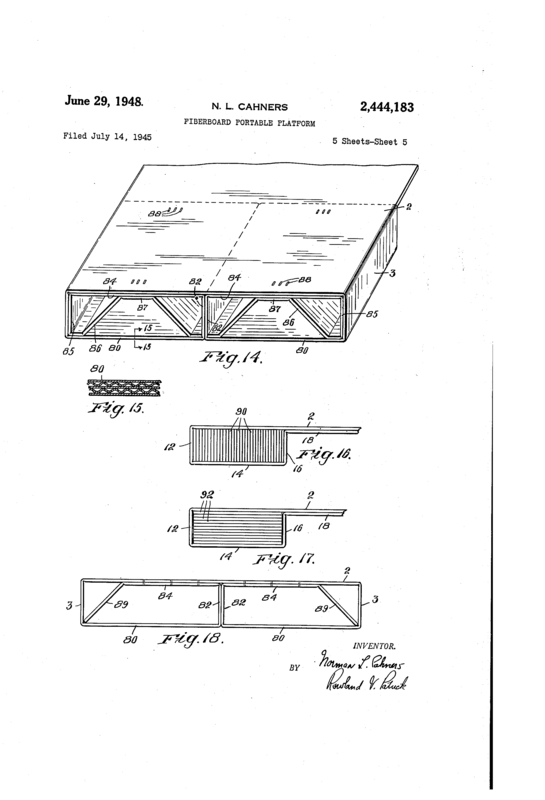 Norman Cahners filed a patent for a fiberboard pallet in 1945. Such platforms have found considerable use in the storage and transportation of goods. The saving in labor handling is considerable where goods may be palletized and shipped through with the pallet to their destination. A drawback to their use in through transportation however, particularly in common carrier transportation, is that the platforms are carried by common carriers at Interstate Commerce Commission rates for the palletized commodity, just as any shipping package or crate. The platform therefore contributes a considerable part of the shipping cost because of its own weight and, in carload lots, involves expensive space consumption. Typical wooden and steel platforms weigh 100 pounds or more. A second disadvantage in present day platforms is the problem of return of empties.” Either the platforms are one use” platforms so that their entire value must be absorbed as a shipping or other overhead cost, or else attention and consideration must be given to their return shipment. Since the cost of wooden platforms runs as high as six dollars apiece, and of steel platforms at least double that figure, single use involves an item of considerable consequence, while unloaded return shipment is a nuisance and an added cost. It is a primary object of this invention to provide portable platforms that are light in weight so that their transportation cost will be practically negligible. It is a further object of this invention to provide highly inexpensive platforms having adequate strengths to handle all but extremely heavy or otherwise unusual commodities, and the small cost of which will justify their one-shipment use. It is a further object of this invention to provide platforms which can be supplied in knock-down form for ready assembly by the user or disassembly for return shipment. Honeycomb beam-style paper pallet (Hexacomb). 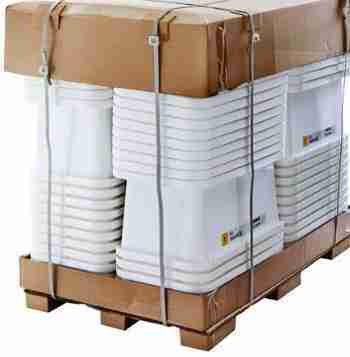 It is a further specific object of this invention to provide lightweight platforms made of fiber which may be sold in substantially flat form for storage in such form; to be folded and assembled into two-way platforms or four-way platforms when used. 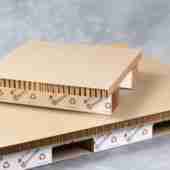 Cahners also filed a patent for an expendable pallet with a solid top deck that could be made from corrugated or other sheet material. While earlier designs used core tubes or similar spacers to provide fork entry, other designs emerged that used other approaches, such as a variety of laminated or folded beams. Honeycomb offered a stiff option for paper pallet construction. Many of the earliest paper pallets suffered from unacceptable performance. Another hurdle that ensuing patents addressed was how to create a design that would make possible cost-effective manufacturing. Today, we see automated production that involves folding technologies that can manufacture pallets from sheet material, with vertical members created by folding sheet, or through the placement and attachment of vertical members. In-line manufacturing systems are offered by Eltete as well as Green Ox Pallet Technology. Additions or revisions to our brief history of paper pallets are welcomed. Contact rick@packagingrevolution.net.